Temporarily Unavailable. Out of Stock. 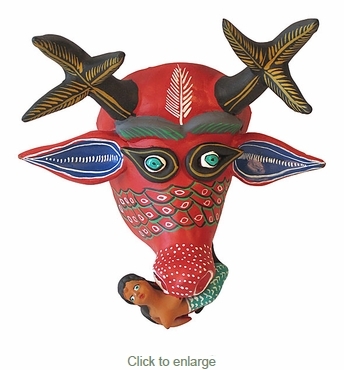 This unique Mexican folk art mask is designed with a deer and mermaid depictions and will add interest to your southwest decor. Our decorative clay masks are handcrafted one at a time by Mexican folk artists. Direct From Mexico will carefully pack your order for safe delivery. Note: The color schemes vary from one mask to the next. The artists usually paint these masks differently every time. The mask you receive may be different colors than what is pictured here.